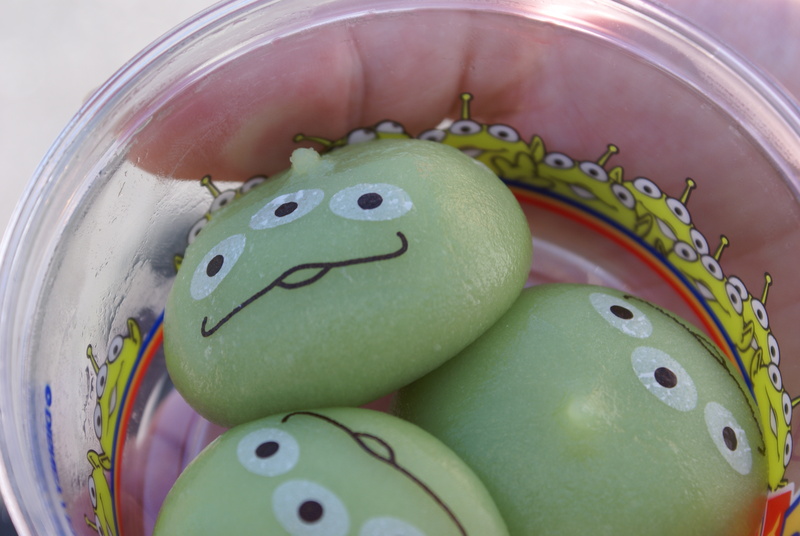 I’ve said it before and I’ll say it again: Tokyo Disney has the best merchandise. I’m sorry, but you just can’t compete with the Japanese on this sort of thing. 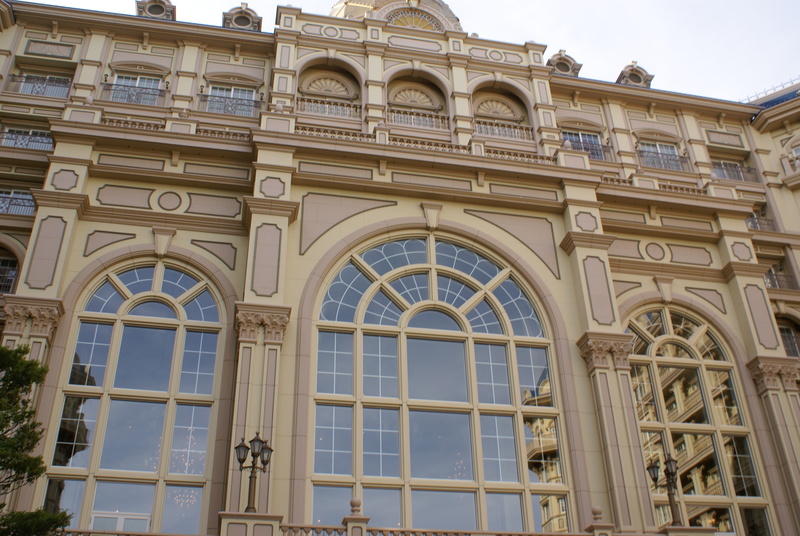 When I visited Tokyo Disney in 2015 (wow, was my trip almost 3 years ago now? ), I wanted to bring home absolutely everything, and if you’ve read my haul post from that trip, you’ll know that I did bring back a lot, but not a day goes by that I don’t see something new and adorable on Instagram and have to fight the urge to jump on a plane to Japan and blow my credit card balance in that happy place. So when I discovered that Tokyo Kawaii Club make amazing little packages of magical merchandise and ship them to all over the world, I couldn’t resist treating myself to a little taster to tide me over until I can get out there again. I ordered the Magic Mailer back in early January, and my package arrived last weekend, although I did have to collect it from the sorting office because I had to pay a customs charge on it, and I was so excited that I ripped it open as soon as I got home. So what did it contain? Firstly, I got this AMAZING Donald Duck diary. I love Donald and I’m a sucker for a cute notebook and this is just perfect for me. Its got a double-page calendar spread for each month, and then pages at the back for notes and doodles, and each page has a little Donald sketch in the corner. I also got a cute little Pluto keyring, which having just had Lunar New Year and bringing in the Year of the Dog, which is also my year of the Chinese zodiac, it was perfect timing, plus I got this sweet little heart-shaped Donald and Daisy button. Speaking of heart-shaped, how sweet is this little tin? 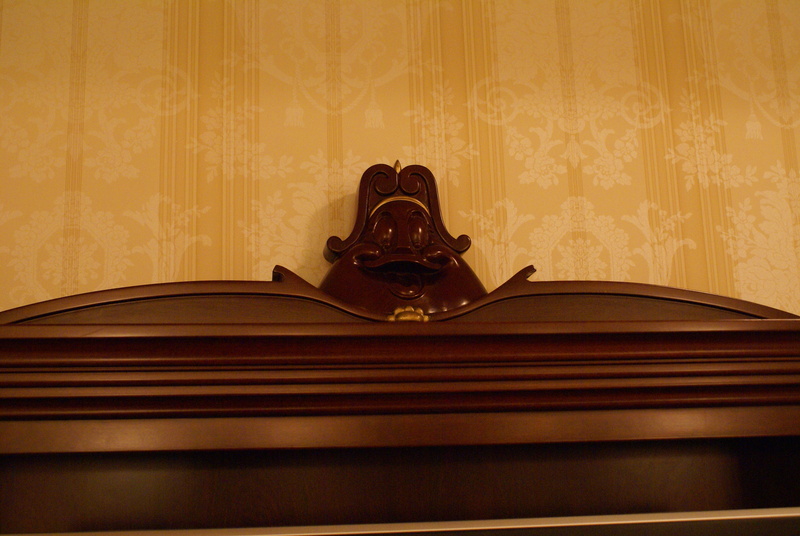 Its full of individually wrapped chocolates with a little Mickey imprint. I also got a set of Tiana notelets which fold up into little paper princesses! Finally, the biggest item in the mailer was this Belle tsum tsum. I’m not sure what its official size is called because its much bigger than a mini tsum tsum but about half the size of the medium tsums that I have, but its still super cute! Tokyo Kawaii Club offers a few different mailer options, and you can even set up a repeat order and have it as a monthly subscription! Michael did a really great job of personalising my mailer with my favourite characters, so I’d love to see what he would conjure up another time for me! 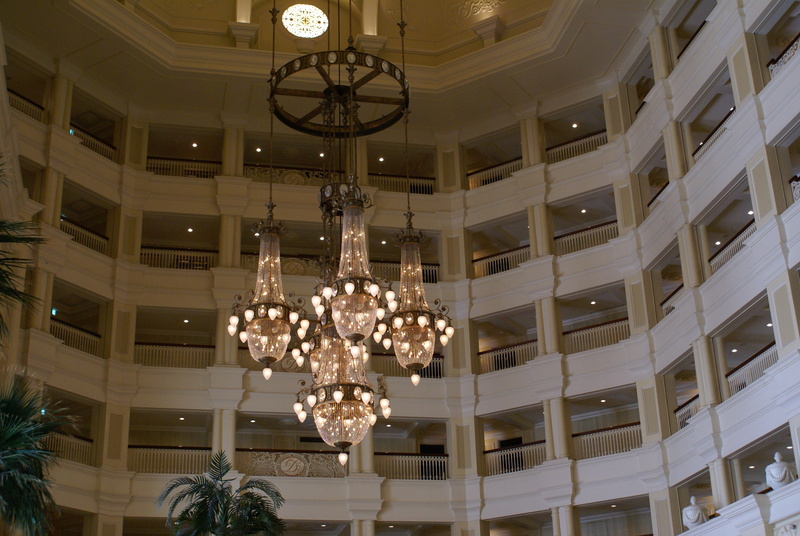 Exactly one year ago to the day, I stepped foot in Tokyo Disneyland for the first time. You can read my trip diary here, but today I thought it would be fun to share some of my unseen photos! 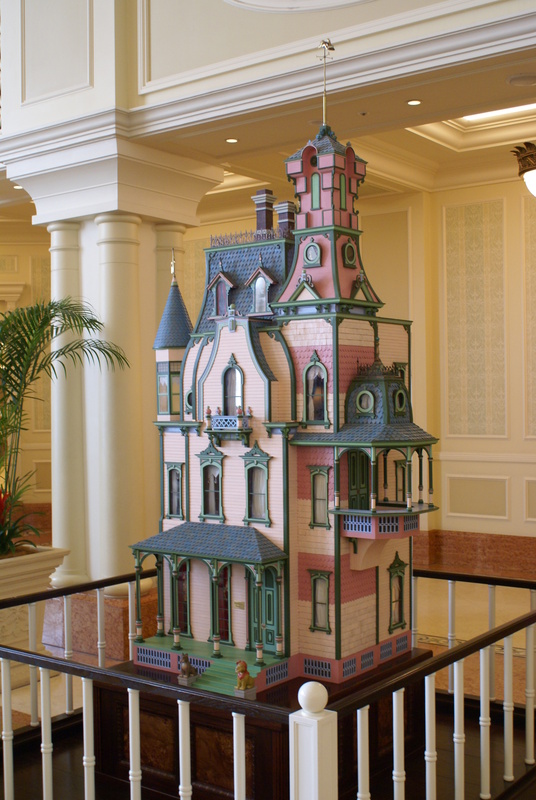 There’s a slight upset among some Disney fans because Tokyo Disneyland doesn’t have a classic Main Street USA when you enter the park, replaced instead with the World Bazaar. 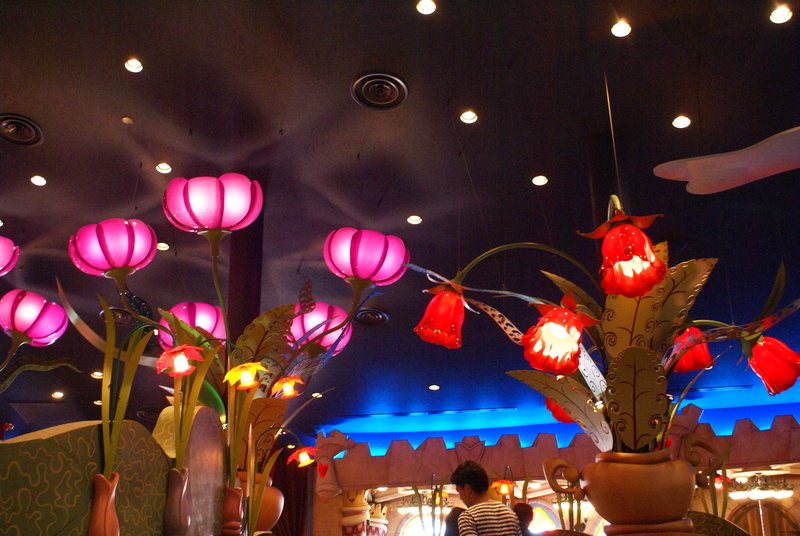 The World Bazaar is a lot like Main Street in a lot of ways, just covered with a kind of greenhouse roof, and decorated with lanterns and flags. First thing in the morning, you’ll get to meet quite the collection of characters at the end of the World Bazaar. My favourites by far were Bernard and Bianca from The Rescuers – so tiny and adorable! I’ve never liked Gideon and Honest John that much, but they seemed to like my camera! 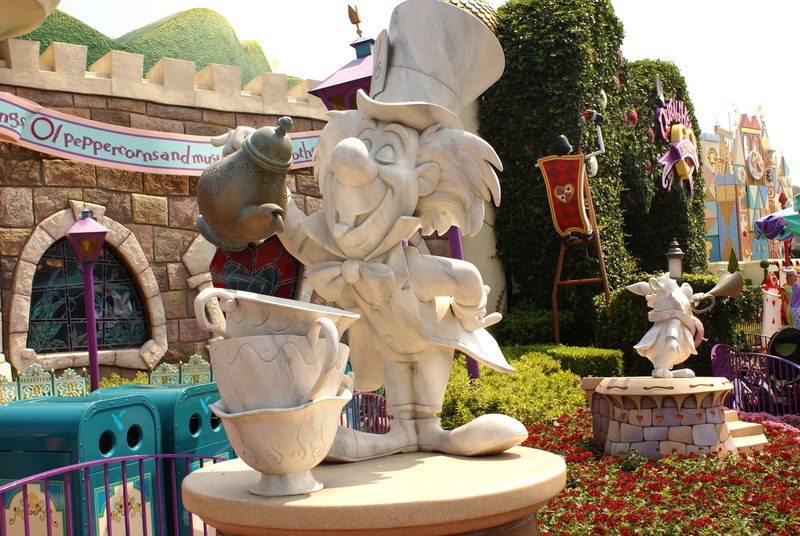 I just love statues in Disney parks, don’t you? 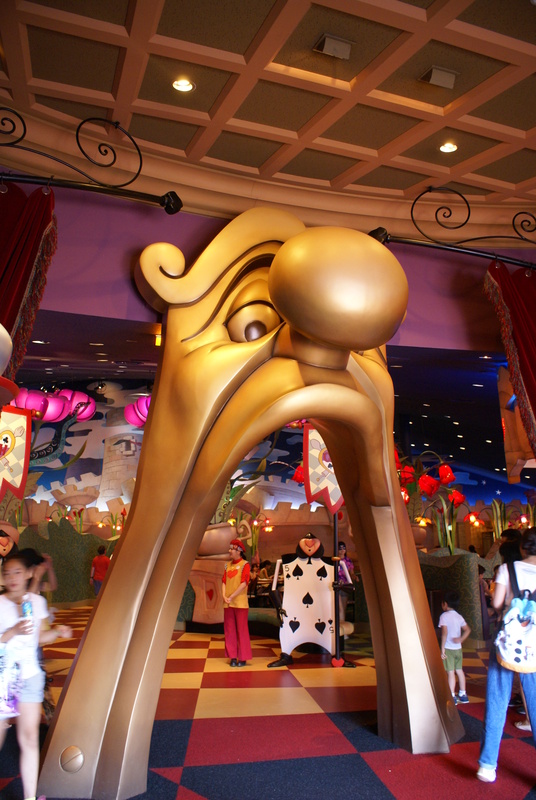 Tokyo DisneySea is a park like no other – quite possibly one of my favourite Disney parks of all time! It is totally unique and packed with amazing attractions and the most perfect tiny details, and I could walk around there all day without going on a single ride and still feel amazed by everything. 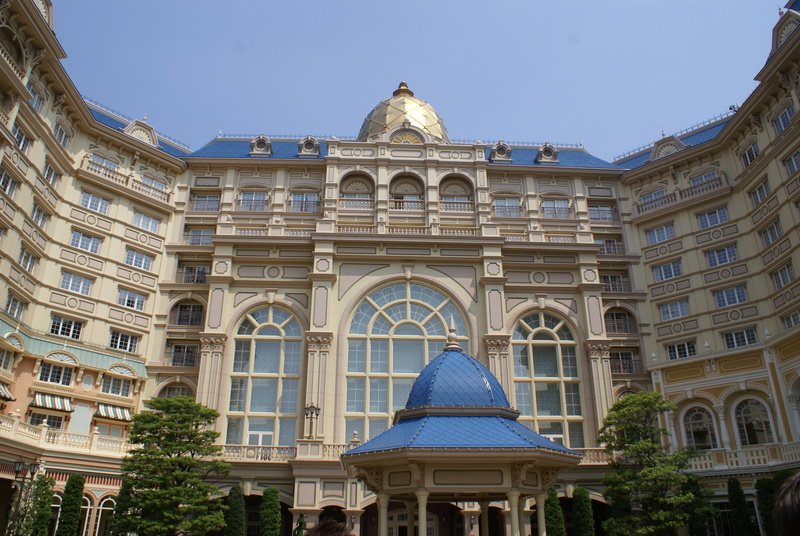 Unlike its Western cousins, the Tower of Terror in DisneySea isn’t sponsored by The Twilight Zone, and therefore has its own unique design and the story behind the ride is different – no spoilers, but its still as scary! There’s also a full-sized cruise ship docked in the park! 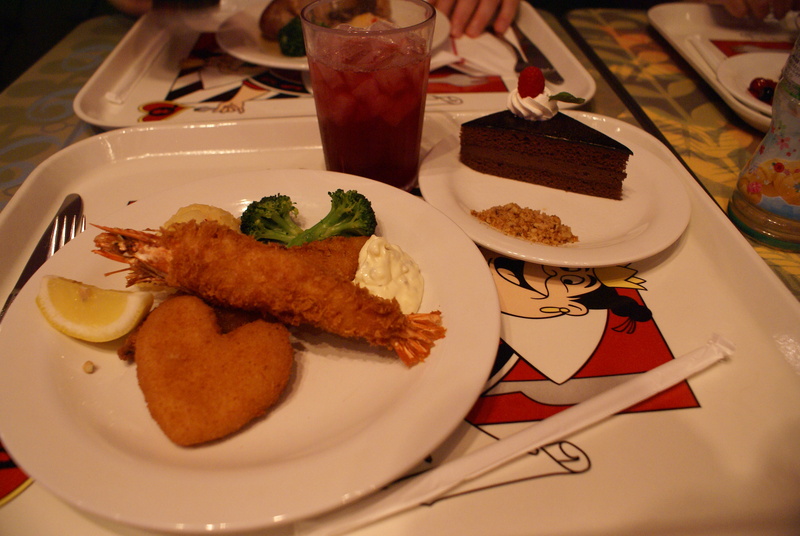 If you’re a little mermaid fan, you HAVE to visit DisneySea just for Mermaid Lagoon. From the outside, you see the beautiful underwater city of Atlantica, just as it appears in the movie, but once you enter and journey under the sea (yes, you really go down!) you can play among the fishes til your heart’s content! Its a great place to avoid summer heat! 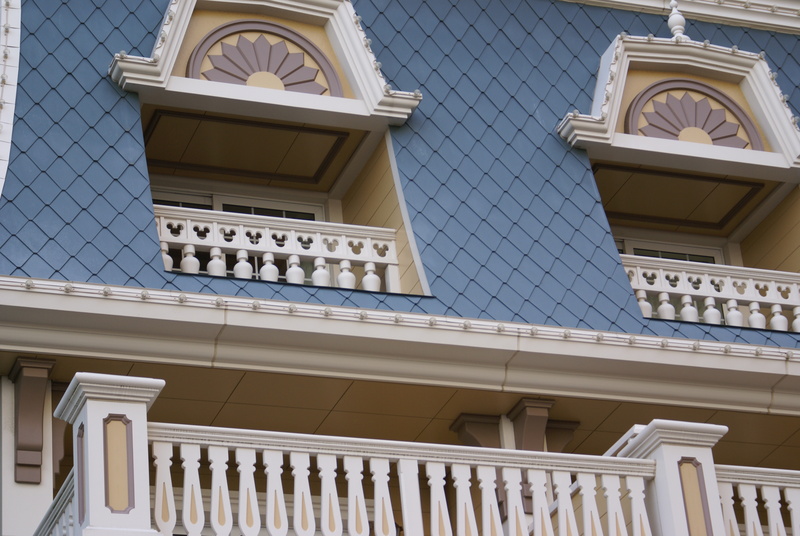 You should also watch out for street rats in Arabian Coast – a practically perfect replica of Agrabah! Hmm.. I wonder where the imagineers got inspiration for this one..
And I’ll just leave you with this absolutely stunning sunset over the Tokyo Disneyland Hotel! With looking forward to my trips to Shanghai and Hong Kong Disneylands, it seems a little crazy that its almost been a year since I visited Tokyo! Tokyo Disneyland was the most unique experience, and I would thoroughly recommend a trip if you get the chance – I’m dying to go back already! 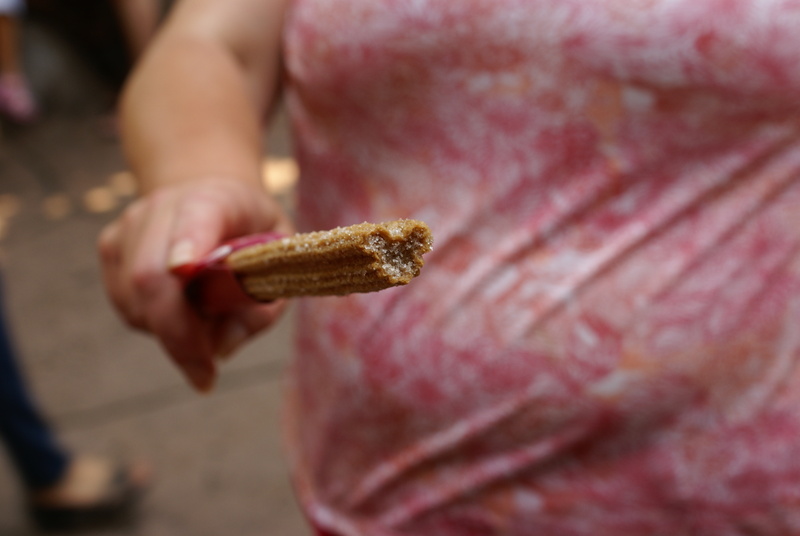 – and one of the many unique features of the parks was definitely the food. Forget corn dogs and fries, the cuisine is almost entirely suited to the Japanese culture, and we didn’t have a single bad meal there! While you may not be in the Western parks, there are a couple of burger options for you, but before you go searching for a cheeseburger, even these have an adorable Japanese twist: steamed buns, and a touch of Disney magic! Today, I’m re-creating the most internet famous of these.. 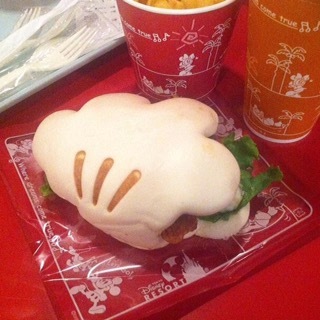 These buns are available at Tomorrowland Terrace in Tokyo Disneyland park, but other variations include a Donald equivalent in Toon Town, and a seashell bun in Calypso Kitchen in Tokyo DisneySea, and now I’m so excited that I can make my own! Put the dough into a lightly oiled dough and cover with a damp cloth, then leave for 2 hours to rise. It should double in size, but don’t worry too much if it doesn’t! Tip it out onto a floured work surface and flatten it out, then sprinkle 1 tsp baking powder over it and knead for 5 minutes. This is where I deviated a little from the method of the recipe. Roll out the dough until its about 1cm thick. I found this easier by cutting the dough in half and doing one half at a time! Using a big flower shaped cutter, preferably a five petal design, cut out shapes from the dough. Using your hands, stretch these out slightly, dab with a bit of oil and fold them over a chopstick so that three of the petals are on top (see that Mickey hand shape?) and repeat with all the dough. Cover the buns with a clean tea towel or oiled cling film, then leave somewhere warm to prove for 1 hr 30 mins. 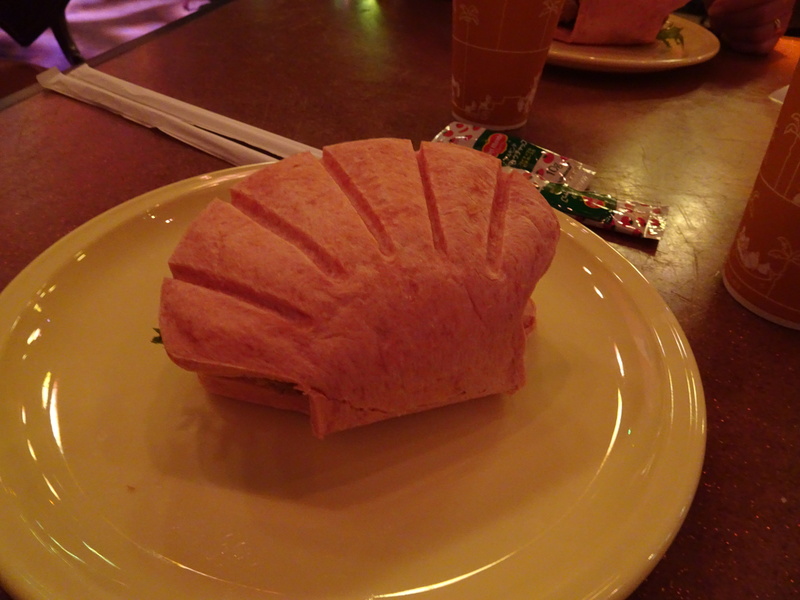 The buns should double in size, but again, don’t worry about this too much – mine didn’t! Before cooking, use black food colouring and a paintbrush or toothpick to add Mickey’s glove markings! Cook the buns in a steamer for 8 minutes, then unfold, fill and close back up! The buns are best served still warm, but still delicious once cooled! I personally recommend filling with pulled pork or teryaki chicken! Love the look of these? Have a look at my favourite crazy Tokyo foods! 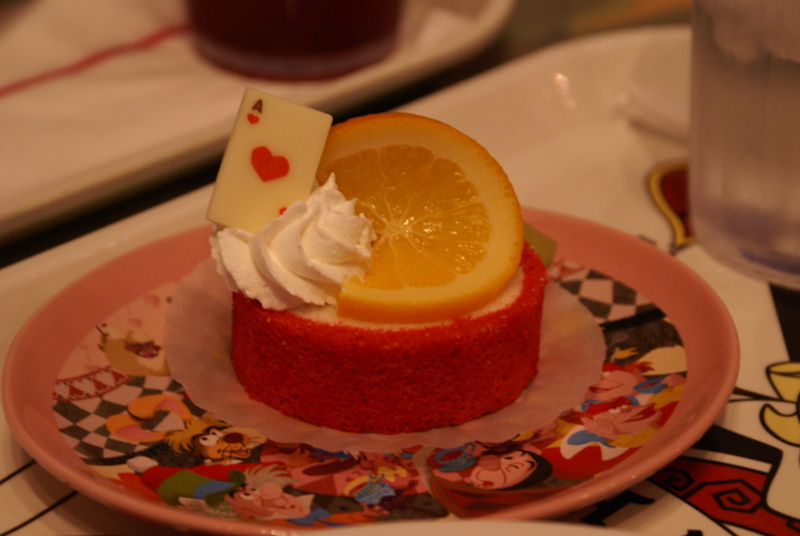 Yes, I’m still reeling about my Tokyo Disney trip even though it was months ago..
Something I was really excited for when preparing for our visit was the food, photos of which I’d seen all over Pinterest and Instagram, and I couldn’t wait to try some of the delicacies in store for us during our stay. Truly, we couldn’t fault any of the food during our entire visit; it was pretty, delicious and reasonably priced – happy family! Don’t you just love it?! I do! 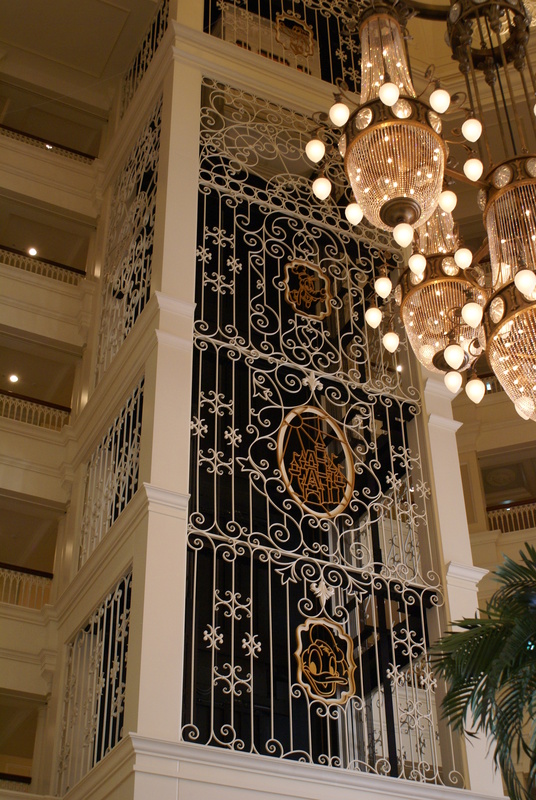 If the exterior doesn’t drop your jaw to the floor, then the lobby definitely will! During our stay, we actually stayed in two different rooms: a standard room for the first night, then we moved into a family room for the rest. 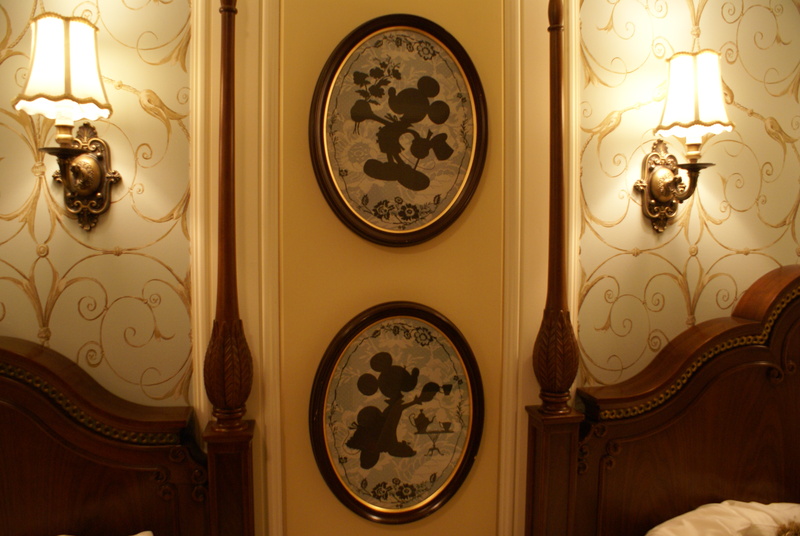 Both rooms had the same decor, a gorgeous classic design, with elements of Beauty and the Beast throughout, so the only difference between the two was the size. 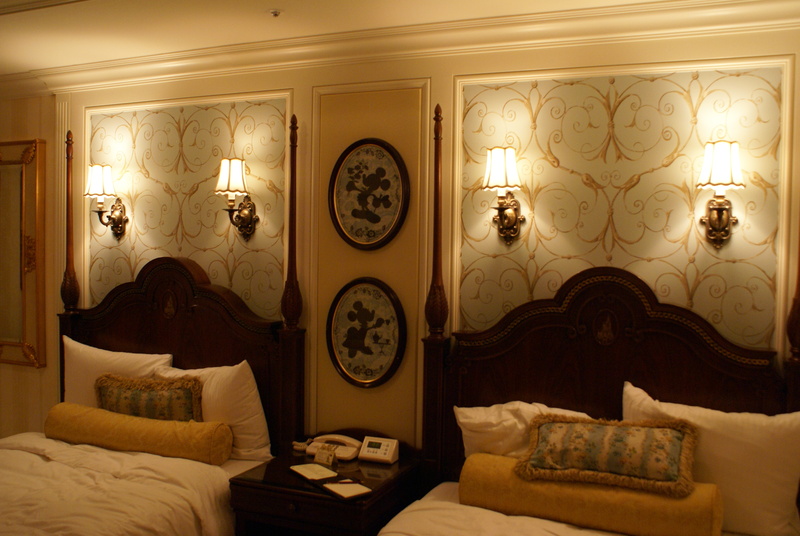 The standard room had two double beds (although double is a generous term, these beds were so narrow my parents ended up sleeping separately! ), but had a roll-out and a sofa bed as well, whereas the family room had three doubles and a roll-out, and also a sitting room area with a sofa and another tv, and both rooms had a sink area, a toilet, and a wet room with a shower and bath. 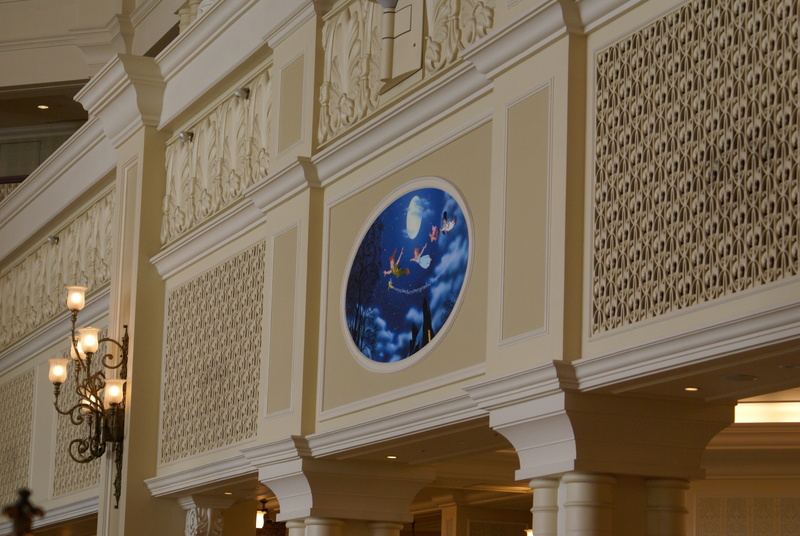 As well as the beautiful lobby, the hotel also has several gift shops, restaurants and a swimming pool (which is pretty small, just to warn you!). 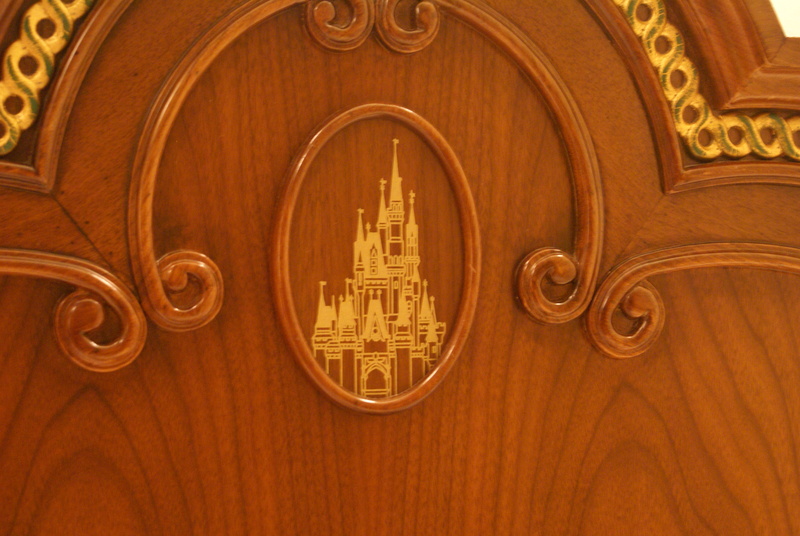 It also has a Bibbidi Bobbidi Boutique for your little princesses, and some really pretty gardens to stroll around. 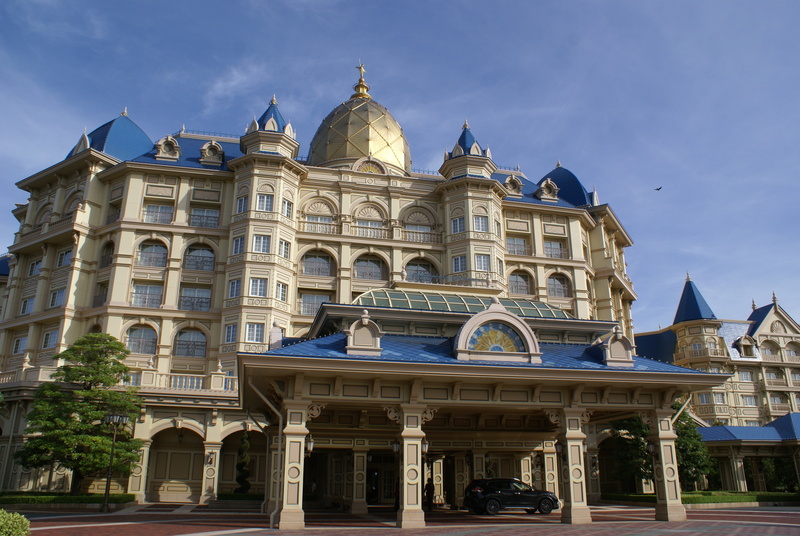 The hotel is literally on the doorstep of Tokyo Disneyland, and less than 100 metres from the monorail station, so there’s no worry about transport to and between the parks, and guests staying at Disney hotels get early access to the parks – only 15 minutes but its worth it – as well as all the extra Disney magic that staying on site provides! 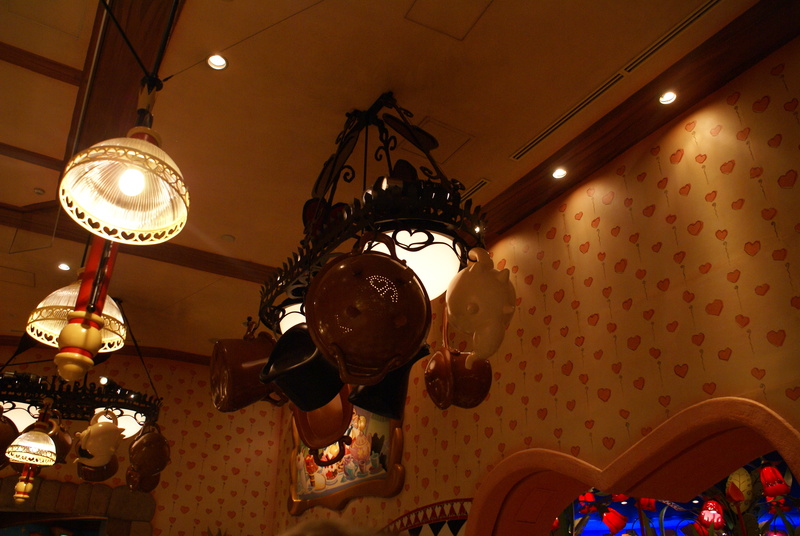 This was by far my favourite restaurant in Tokyo Disney. I had seen pictures online, and I knew I wanted to eat here! 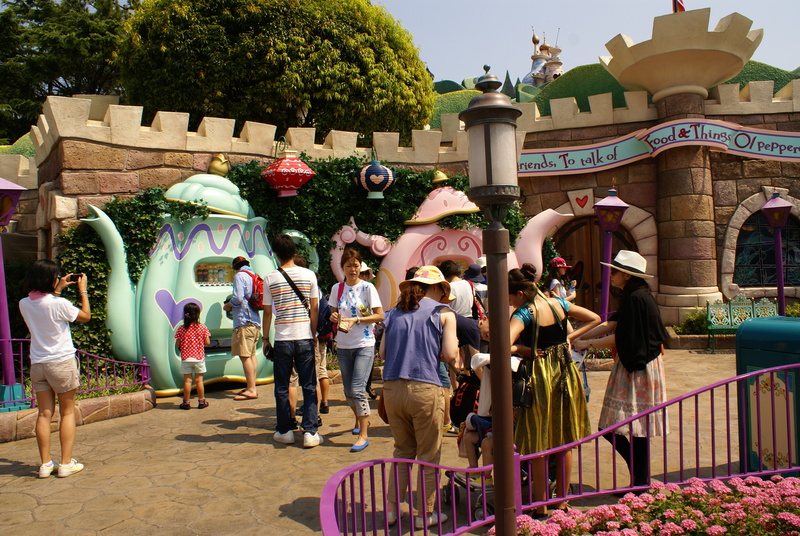 QoH is right in the centre of Fantasyland, next to ‘Its a Small World’, and you can’t miss it! Its surrounded by statues of the Alice in Wonderland characters, as well as the iconic teapot vending machines, and perfectly pruned shrubbery. Once you step inside, you’re transported into the Queen’s gardens; mazes, red roses, Playing Cards, even a Cheshire Cat! 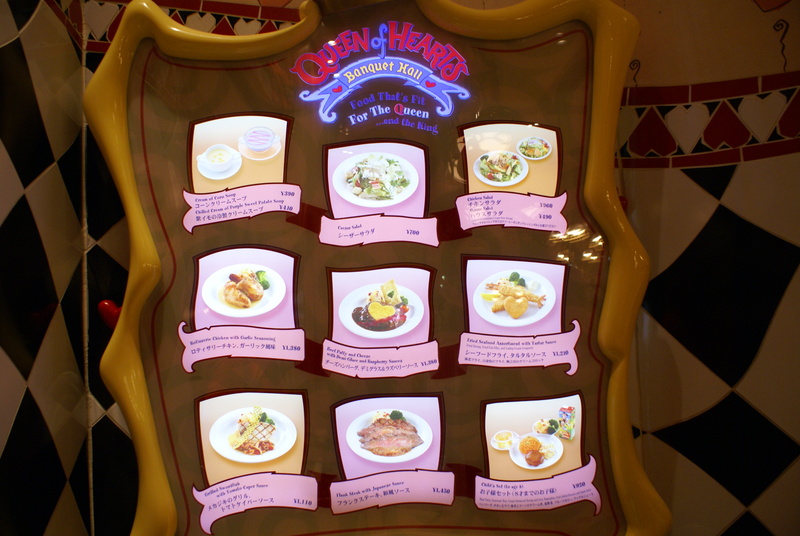 The restaurant is a ‘buffeteria’, a cross between serve yourself and being served (grab your own dessert, choose your main, be seated by a cast member). 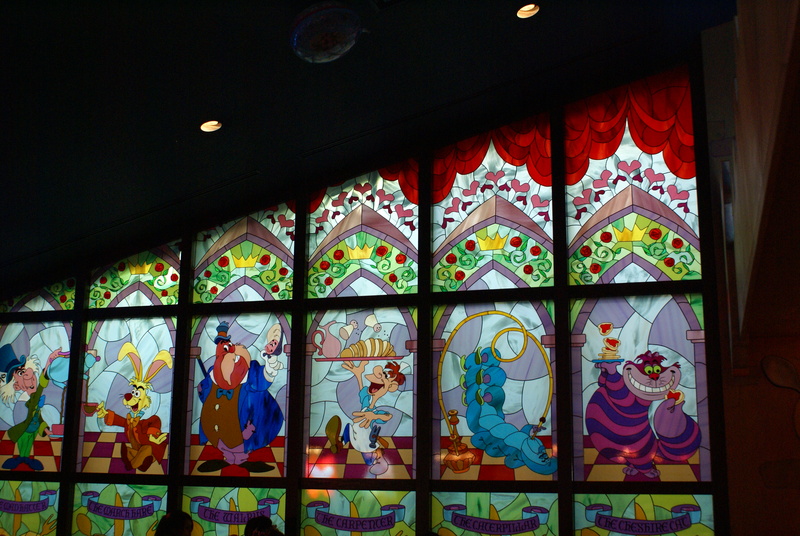 The scenery is phenomenal, everything from stained glass scenes to giant flowers! And as for the food.. Unbelievable! 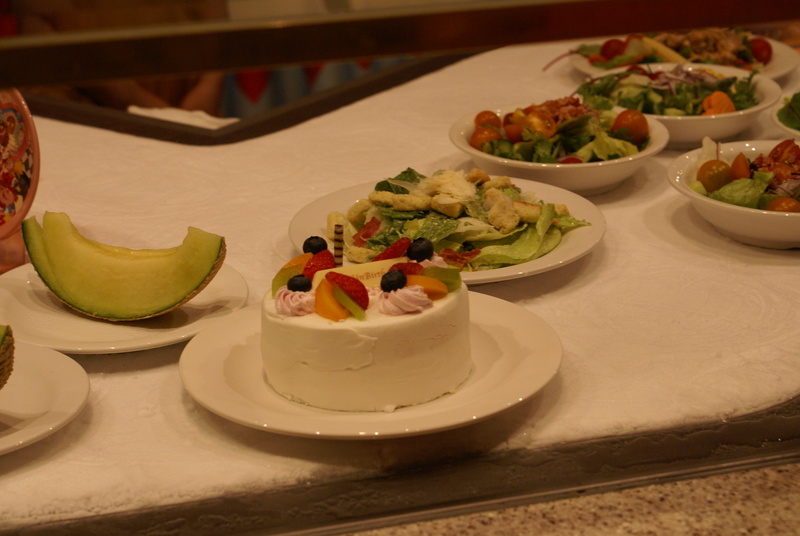 I had a seafood selection and a chocolate fudge cake, both totally faultless! 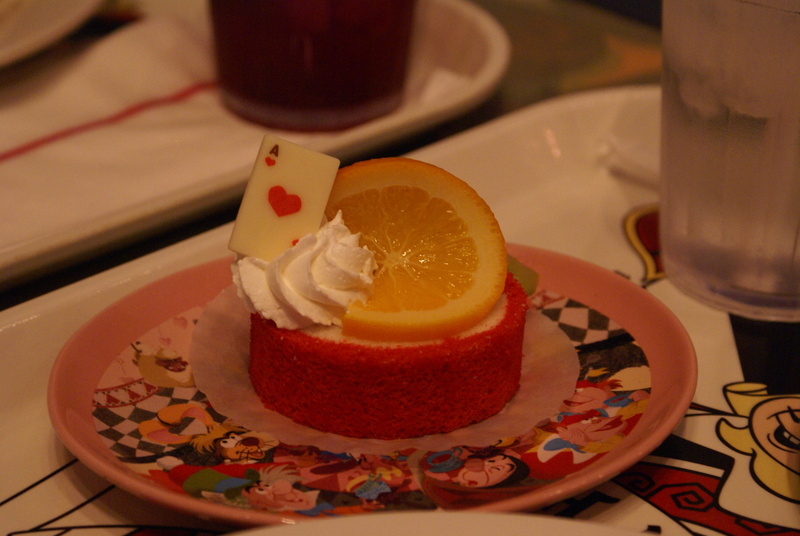 All of the choices had something Alice in Wonderland themed about them, and some of the dessert selections had souvenir bowls or plates (my sister had the cake, I got the plate!). Sweet, right?! There was loads of seating, so we didn’t feel at all crowded, and entirely indoors which was perfect for the heat. 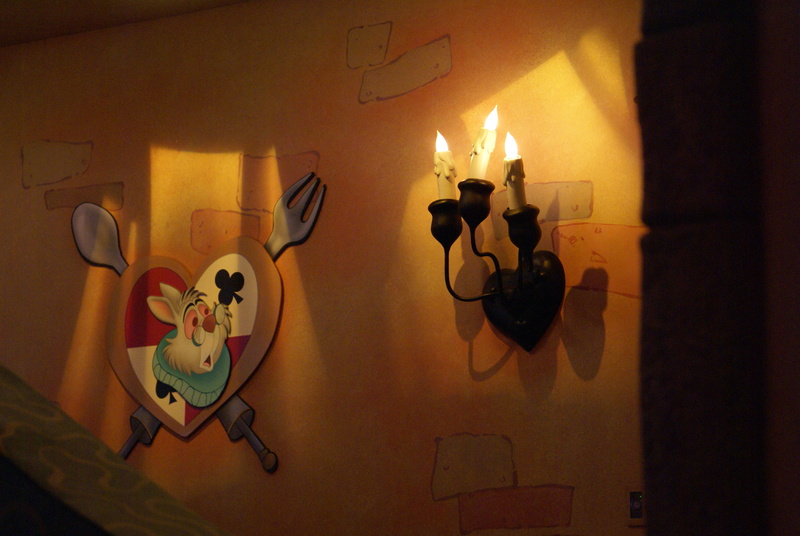 It really was a totally unique dining experience, even the toilets were keeping with the theme! 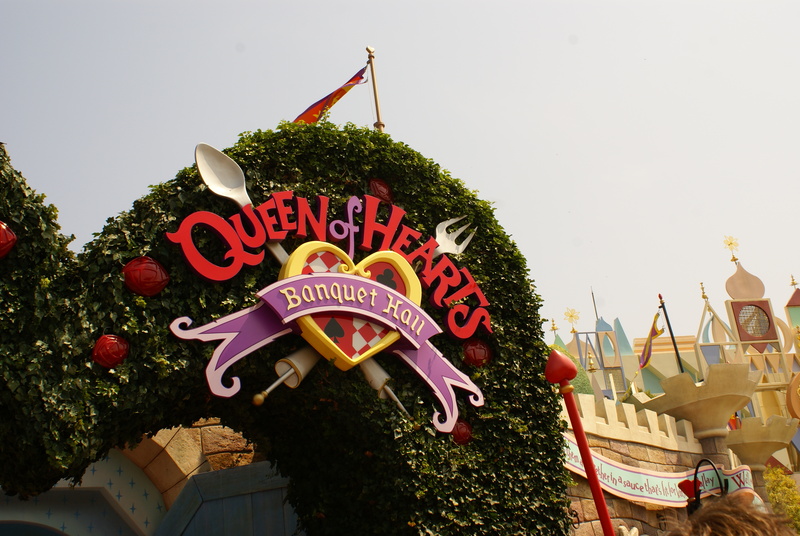 The Queen herself would be most impressed, and if you don’t eat here, then off with your heads!